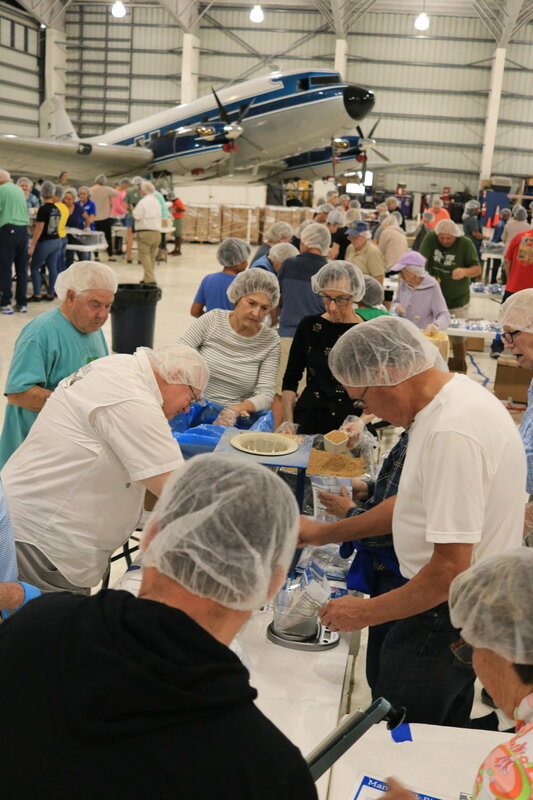 On Saturday, January 12, 2019, Missionary Flights International (MFI) hosted a Feed My Starving Children (FMSC) MobilePack™ event at their hangar in Fort Pierce, FL. The event saw 485 volunteers with a total of 470 boxes packed and 101,520 meals provided. 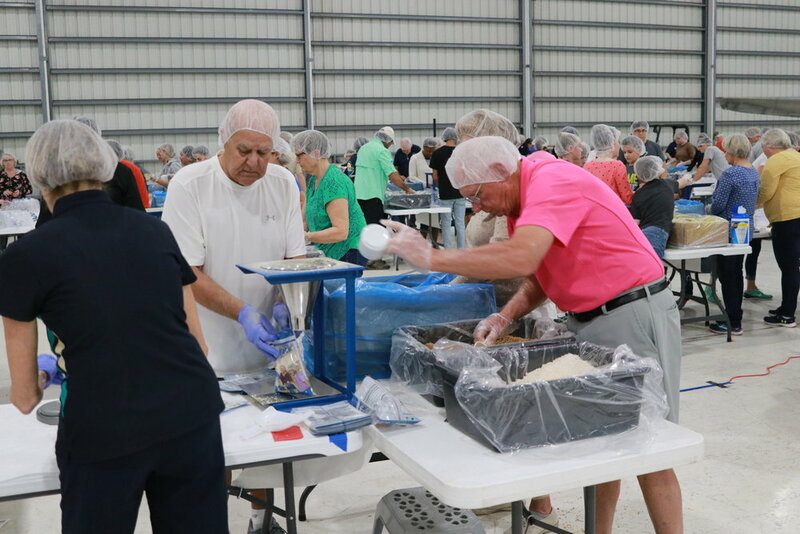 There were two shifts of volunteers that attended to pack meals, one from 9:00 a.m. until 11:00 a.m., and one from 12:00 p.m. until 2:00 p.m. Before the event began, MFI staff, volunteers, and the directors from FMSC ensured that the MFI Hangar was cleaned and converted into an FDA approved packing facility. Crystal, part of the FMSC MobilePack™ Staff, calls for “all hands up” as she provides final instructions. 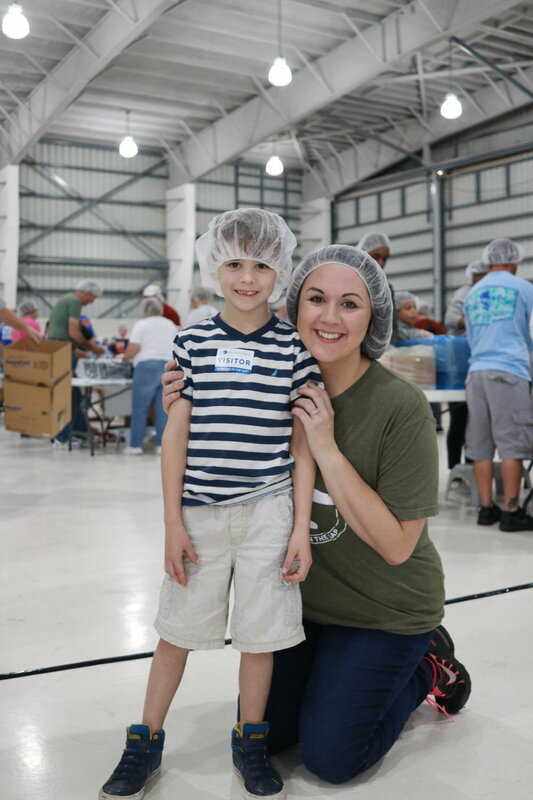 Feed My Starving Children is a Christian non-profit dedicated to seeing every child and person around the world healthy, nourished and whole in body and spirit. FMSC meals are hand-packed by volunteers and sent to an incredible network of partner organizations who distribute them to those in need. Nearly 1.2 million volunteers packed more than 333 million FMSC meals in 2017. More than 90 percent of total donations go directly to feed kids. 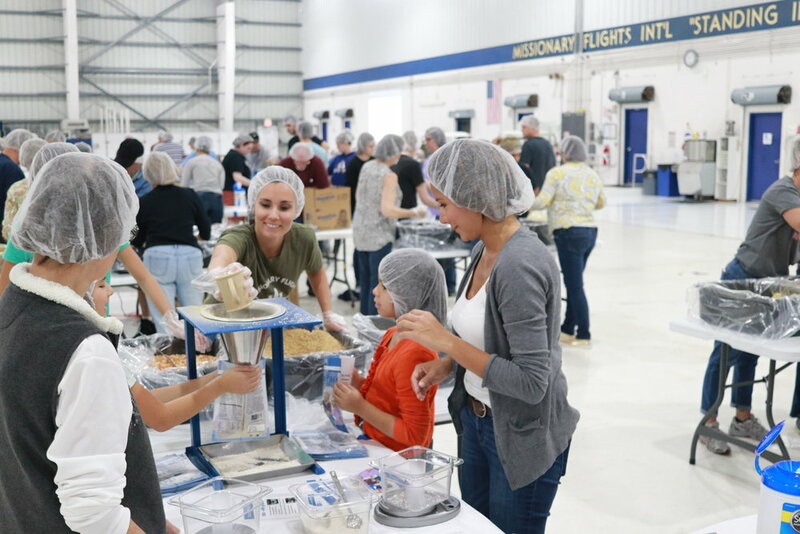 During a FMSC MobilePack™, local donors and volunteers engage in powerful meal packing experiences to improve the lives of malnourished children around the world. MFI President, Joe Karabensh, welcomed the groups and thanked them for their commitment to serve for the morning. After taking some time to explain MFI operations, FMSC staff spent a few minutes in training for the event. From that point, each two hour shift consisted of individuals putting packing date labels on bags, delivering supplies to stations, assembling supplies in Manna Packs, boxing bags, and wrapping pallets. 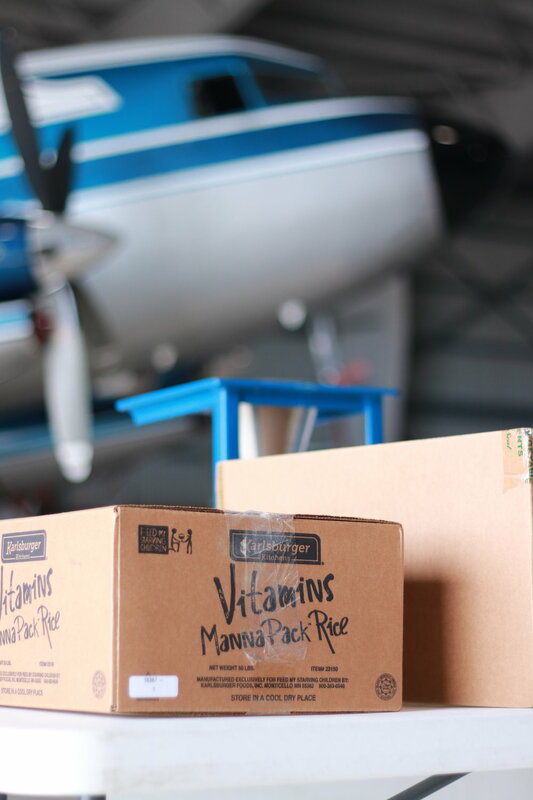 A Manna Pack has four key ingredients: vitamin powder, dried vegetables, soy, and rice. The rice acts as a key ingredient to provide carbohydrates that fill the stomach, but it is also a universal grain. No matter where these bags end up in the world, a person will understand how to cook the ingredients whether they can read the instructions or not. Pilot Ray & Tammy Oostdyk are joined by their daughter Julia, son Josiah, and other students from their church small group. Packing stations were set up in groups of ten, and as one station cheered upon the completion of the first box, the room erupted into a murmur of competition. Each station was encouraged to pack boxes safely and correctly, but that did not stop the sideways glances exchanged by friendly groups seeking to out-pack one another. MFI works as a strategic partner to distribute food to affiliated missions as they have need in Haiti. While FMSC sends a good majority of food into the country through other organizations, MFI is able to work with affiliated missions to transport food into areas where a container is not necessary. Food is also kept on reserve for natural disaster events where immediate needs are seen and then can be met quickly. The second shift of the MobilePack™ closes the event by joining FMSC staff in praying for the food that will feed the hungry in Haiti. This years FMSC event cost Missionary Flights $22,239. That cost is offset by the donations that come in from event participants and teams who raise funds or chose to donate an estimated $50 per participant. As of January 14, 2019, MFI had raised $17,544 toward their goal. Most of those funds are raised throughout the year on the MFI website or via check written for the event. Leading up to the event, an online fundraising platform is also created and hosted on the FMSC website. Linda Ageeb, a Math Teacher at John Carroll High School in Fort Pierce, FL, commented, “John Carroll High School loves to give back to the community and those in need. 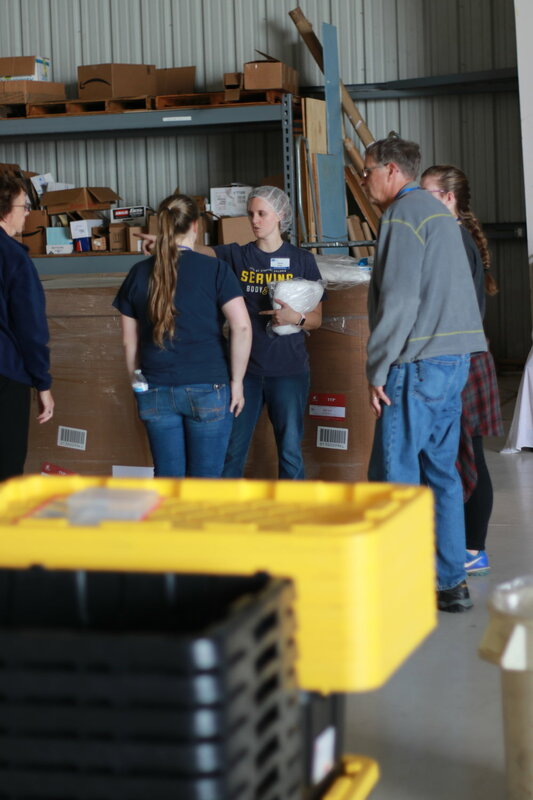 We are so happy to be a part of this event.” The team of John Carroll students, their family members, and alumni helped pack boxes and raised $1,230 in donations! The next FMSC MobilePack™ Event is scheduled for Saturday, January 11, 2020. Registration for this event will open on December 1, 2019. 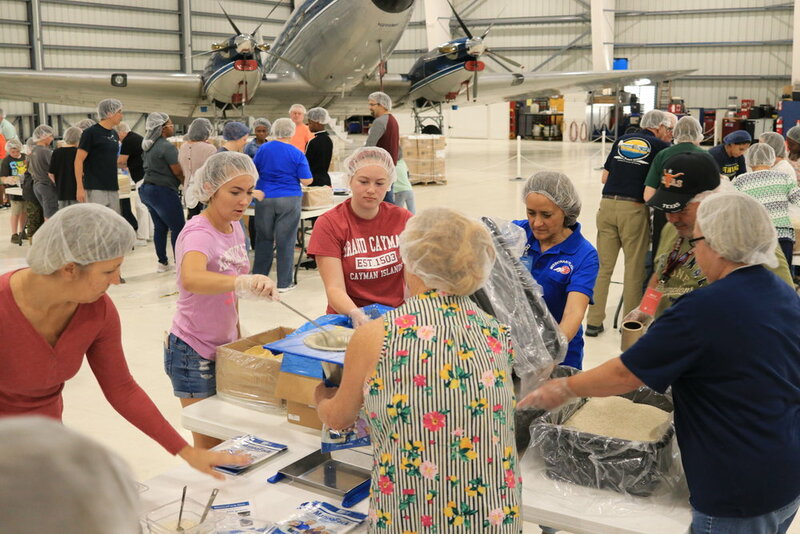 If you are interested in donating to Missionary Flights for future Feed My Starving Children MobilePack™ events, please call 772-462-2395 or locate the FMSC link on the giving section of the website.